Taking advantage of a unique cosmic configuration, astronomers have measured an effect predicted by Albert Einstein's theory of General Relativity in the extremely strong gravity of a pair of superdense neutron stars. Essentially, the famed physicist's 93-year-old theory passed yet another test. Scientists at McGill University used the National Science Foundation's Robert C. Byrd Green Bank Telescope (GBT) to do a four-year study of a double-star system unlike any other known in the Universe. 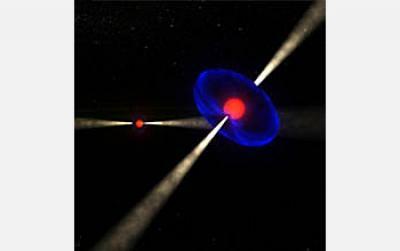 The system is a pair of neutron stars, both of which are seen as pulsars that emit lighthouse-like beams of radio waves. Einstein's 1915 theory predicted that in a close system of two very massive objects, such as neutron stars, one object's gravitational tug, along with an effect of its spinning around its axis, should cause the spin axis of the other to wobble, or precess. Studies of other pulsars in binary systems had indicated that such wobbling occurred, but could not produce precise measurements of the amount of wobbling. The pair of pulsars studied with the GBT is about 1,700 light-years from Earth. The average distance between the two is only about twice the distance from the Earth to the Moon. The two orbit each other in just under two and a half hours. "A system like this, with two very massive objects very close to each other, is precisely the kind of extreme "cosmic laboratory" needed to test Einstein's prediction," said Victoria Kaspi, leader of McGill University's Pulsar Group. Theories of gravity don't differ significantly in "ordinary" regions of space such as our own Solar System. In regions of extremely strong gravity fields, such as near a pair of close, massive objects, however, differences are expected to show up. In the binary-pulsar study, General Relativity "passed the test" provided by such an extreme environment, the scientists said.